Waldo Beebe, a Burris High School graduate, never expected to live in Muncie, Indiana permanently. It was his hometown, but the spirit of youth, serving four years in the Navy in World War II, and possibilities beyond took him overseas. After graduating from the University of Virginia and Indiana University School of Law, Waldo and two friends went to Europe for a little vacation. While traveling he decided to take a job in Nuremburg, Germany, working for the U. S. Government returning World War II confiscated real estate to its German owners. Then a chance meeting on a train changed his life, brought him home, and he developed a relationship with Ball State. "In post war Germany, there was no air conditioning on a train, and the windows were open," he says. "Hanging out the window I noticed a very attractive gal wearing a pink coat, which was extremely unusual for that time. A few minutes later, she got on the train. I was lucky. She got on my car and we started talking." Beebe soon brought his Austrian love, Louisa, home to his family. "I had always thought 'I'm never going to stay in Muncie,' but she was a transition in my life and my thinking, and I came back home with a completely different attitude. I saw what a great place it is to live and raise a family." And that's what they did. He became president of his family's abstract title company in Muncie while raising three daughters and a son. Louisa has since passed. His son, Otto, graduated from Burris High School, Ball State with a B.S. in mathematics, and Purdue University with a master's degree. He went on to work in the defense and telecommunication industries. After Otto's untimely death and because of Waldo's interest in Ball State, he established a charitable remainder trust in Otto's memory to pay lifetime income for Otto's widow, Judy. The assets placed in the trust pays income to Judy until her death and then the remaining balance goes to Ball State. 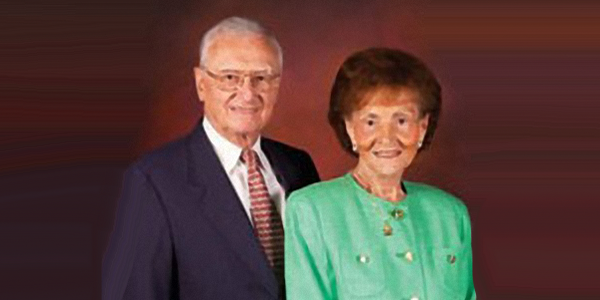 Looking into the future, the Beebes also wanted to provide for their grandchildren by creating a charitable lead trust. The lead trust is the reverse of a charitable remainder trust. With a lead trust, the earnings of the trust help the university now. "In 2033, six grandchildren will receive the balance of the lead trust for their use and benefit," he says. "It's funny now to think that I thought I would never live in Muncie. Muncie and Ball State has been such a huge part of my life. I want to help others find that connection, too." for details.The information on this website is not intended as legal or tax advice. For such advice, please consult an attorney or tax advisor. Figures cited in examples are for illustrative purposes only. References to tax rates include federal taxes only and are subject to change. State law may further impact your individual results.